With last week’s tour de force, I honestly thought Gotham was going to slow down a bit, particularly with the McKenzie-scripted trial of James Gordon on the horizon next week. Little did I realize that, with “Nothing’s Shocking,” the show was about to capitalize on a relationship from all the way back in season one. “Nothing’s Shocking” opens with Barbara trading info for drinks. As the two cops sit down at the bar, Dix, Harvey’s ex-partner, is up and walking around, and, apparently, he’s murdering some old compatriots. After the title card, we join Bruce and Alfred as they are informed about a woman’s husband, Hank, who decided to play hero down in the sewers, and debate whether to tell Gordon. Ultimately, they decide he’s already spread in a million different directions and that they will undertake the search themselves. “Nothing’s Shocking” cuts to Gordon and Harvey, who have been summoned to the club by Barbara, who fills them in. Given his disability, Harvey proclaims there’s no way Dix could be behind this. As our heroes are visiting Harvey’s old partner, they are attacked by someone with a proclivity for masks. We later discover that her name is Jane Cartwright, whose mother stabbed her father – a case which Harvey, Dix, and the two cops killed at siren worked several years prior. “Nothing’s Shocking” then turns to Nygma and Penguin, the latter of whom has procured a new henchman by the name of Dale. All I could think of during this scene was how much I missed Butch. That didn’t last long, however, as the Penguin’s new muscle is quickly dispatched by a returned Mr. Penn, who turns out not to be dead after all and is under the control of a dummy. This scene reminded me of multiple iterations of the Dark Knight – Kids WB’s The Batman series from the 2000s with the dummy, and the 1966 Batman movie, where, instead of the Penguin and the Riddler arguing on a submarine in the film, they’re arguing about one. Here’s hoping we’ll get more references to the Bright Knight as this storyline continues. Meanwhile, Gordon goes to track the killer, as he feels Harvey’s hiding something from him. 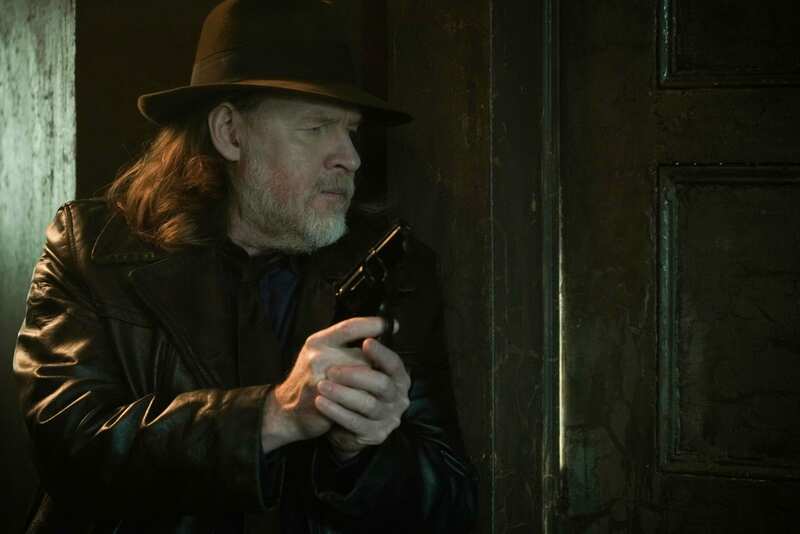 I really like Donal Logue’s work here, as it emphasizes his guilt in not being there for Dix during all the chaos. Gordon heads to Cartwright’s house and captures Jane Doe. After questioning her, he starts putting some prices together. Cartwright was brought to Indian Hill, where Strange did experiments on her, thus allowing her to inhabit other people’s skin. The rest of the information, she says, lies with Harvey. As Gordon leaves her, she changes into Harvey and then goes to kill Dix. Bruce and Alfred go searching in the sewers for Hank. They find him, as well as several people who have gone mad due to the toxins. All the while, Alfred is dealing with his guilt over last week. 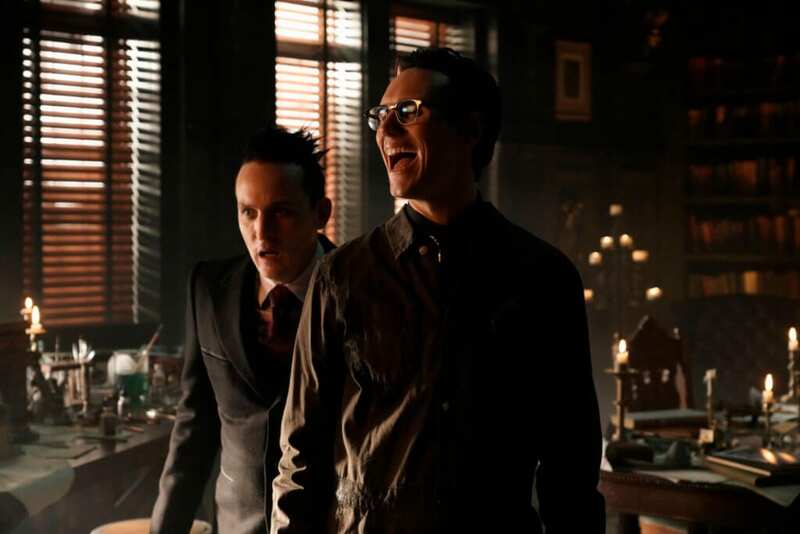 “Nothing’s Shocking” then goes back to Nygma and Penguin, as the latter is finally getting called onto the carpet for how he treats people in a far bigger way than he ever has before. We also find out that the dummy, Mr. Scarface, “wants to be boss of Gotham.” Ah, Gotham; I’m going to miss you in a few weeks. Barbara gives Gordon a tip about the case: the kid’s guilty too. Then she asks if she is going to jail since she was on Dorrance’s list. When Gordon says he doesn’t know, she accuses him of being happy about that. He claims that’s not what he wants, and she tries to strike a deal: if she goes straight, she wants a clean slate. Before Gordon can answer, he sees Harvey coming down the steps and quickly puts together that Cartwright has Dix. They find Dix’s body, and Harvey, racked with guilt, seeks justice. While Bruce and Alfred fight the crazed sewer dweller, Gordon puts the GCPD into lockdown. Masquerading as Barbara, Cartwright tries to take the real Barbara hostage but fails, and Harvey chases after her. Nygma and Penguin are in a holding pattern after Nygma buys them some time. Eventually, they get the drop on Penn and Mr. Scarface and reaffirm their partnership, a scene I feel we’ve seen once before this season. Although it doesn’t end well for Mr. Penn, I liked the fact that one of Penguin’s henchmen stood up to him thus giving us a great performance from Robin Lord Taylor. Harvey finds Jane, who is so far gone that Harvey can’t reach her, and ends up killing her in self-defense. After Bruce absolves Alfred of his guilt surrounding the destruction of Wayne Manor, “Nothing’s Shocking” has a scene with Harvey and Gordon where the former confesses to the latter his part in the Cartwright case, with her mom having initially recanted her confession. Harvey had convinced her to make a statement against her mom, only later discovering the husband beat both mother and daughter, thus setting the latter on her path to becoming one of Strange’s guinea pigs. Gordon tells his partner he can’t give him forgiveness. With that, Harvey walks out of Gordon’s office. I like Logue’s performance in this scene because it shows how much he has grown, but unlike Bruce and Alfred, Gordon can’t be his absolution. Writer Seth Boston does pretty well this week. I loved that “Nothing’s Shocking” is a Harvey-centric episode with great performances from both Logue and Taylor. I just wish they’d moved the Nygma/Penguin dynamic along a bit and given Alfred’s guilt some more air time. Kenneth Fink gives us a point of view on the sewers of Gotham and the unique abilities of Cartwright. Gotham is bringing things full circle, but it’s starting to seem like they didn’t have enough for certain characters to do, particularly Nygma. Even though “Nothing’s Shocking” didn’t, well, shock me (outside of Logue and Taylor), with a trial and a time jump coming up in the next few weeks, I’m excited to see what’s still to come. "Nothing's Shocking" is a Harvey-centric episode with great performances from both Logue and Taylor. I just wish they’d moved the Nygma/Penguin dynamic along a bit and given Alfred’s guilt some more air time. Kenneth Fink gives us a point of view on the sewers of Gotham and the unique abilities of Cartwright. Gotham is bringing things full circle, but it’s starting to seem like they didn’t have enough for certain characters to do, particularly Nygma.